It’s the first week of March and while spring is around the corner and the weather is warming up, it’s still cool and damp in the evenings, making it the perfect occasion for a hot soup, to warm you from the inside out. I absolute love soups, from chunky soups to creamy soups to noodles in broth. They’re easy to prepare, make a nice first course at a dinner party and make a light and healthy main course for a quick weeknight dinner accompanied by your favourite side dishes. 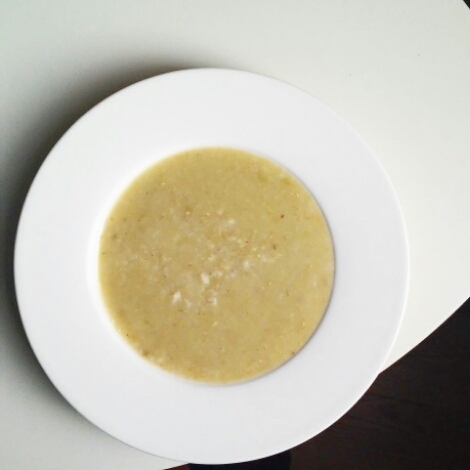 In fact, one of my go to recipes for an easy weeknight dinner meal is Creamy Barley and Leek Soup. It’s rich and creamy in texture, but delicate in flavour. The leeks provide a mild onion flavour while the Shiro Miso, also known as white or mellow miso, adds a touch of sweetness, and the barley adds robustness. The result: a delicious, wholesome, and nutritious soup that won’t weigh you down. Best of all, this recipe is hubby approved. The first time I made it for him it was a Saturday and we had somewhere to be in the afternoon, so we didn’t have a lot of time to spend preparing lunch. Mid morning, I quickly prepped and tossed everything in a pot and let it simmer for 40 minutes while I did other things (an added bonus for soups, they can be prepared in advance and practically cook themselves). At one point hubby asked me “what are you making for lunch”? So I responded, “Barley and Leek Soup”. The look on his face was priceless, followed by, “hmmmm…”, and not in the positive sense. Lo and behold, he took one sip from the side of the spoon and exclaimed “che buono” (translation: how yummy). As hubby usually does when he likes something, he had seconds, with a smile on his face. Hubby is Italian, from Tuscany. When I first met him, his diet consisted of pasta, piadina (Italian flatbread sandwiches) and pizza, among other traditionally Italian fare. He wasn’t very adventurous when it came to food, and cooking for the two of us was a bit of a challenge at times. Over the years I have honed my cooking skills and he has expanded his horizons and opened up to a whole new world of culinary possibilities, earning his role as my official food taster and guinea pig. So, here is the recipe, give it a try and let me know what you think. Chop leeks into 5-10 mm round slices and wash thoroughly. Heat oil in a pot on medium heat for a few seconds. Add leeks and a pinch of salt and saute for 3 minutes. In the meantime rinse pearl barley in cold water and strain. Add to leeks and saute for a few minutes until slightly toasted. Reduce heat to low, cover and let simmer for about 40 minutes. A bit of the liquid should evaporate, but not all of it. When soup is ready and barley is well cooked, remove from heat and add shiro miso, previously diluted in a 1/4 cup of warm water. Mix well to combine. If you’re not planning to eat all of the soup in the same day, only add the shiro miso to the portion you are planning to eat. Miso is a live enzyme and overheating it will destroy it, so don’t add it to any portions that need to be refrigerated and reheated, until you are ready to eat them. Puree half the soup with an immersion blender and combine with the other half. The result will be a rich and creamy soup with a chewy texture. I hope you enjoy it as much as hubby and I do!